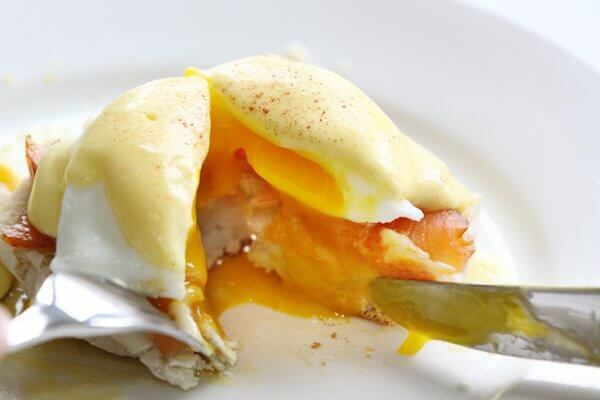 Eggs Hemingway or eggs Atlantic is a variation of the classic eggs Benedict. Eggs Benedict consist of toasted English muffins halves, each topped with Canadian bacon, a poached egg and Hollandaise sauce. Numerous variations exist, and my favourite is eggs Hemingway, which substitutes the Canadian bacon with smoked salmon. While it’s usually a splurge when eating out, it’s actually quite easy to make at home. Making a Hollandaise sauce and poaching an egg are both considered tricky or advanced cooking techniques… but once you do them once, you’ll realize they’re really not. Martha Stewart has a great video that illustrates both techniques very well. Let the smoked salmon come to room temperature. Prepare a double-boiler for the Hollandaise sauce. Fine Cooking provides an excellent recipe and instructional video (I followed this recipe rather than Martha’s version). The sauce can stay on the double-boiler while you prepare the other components. Toast the English muffin halves while you poach the eggs. Crack each egg into its own ramekin. Gently pour each of the eggs into the simmering vinegar water. Once they’ve all been submerged, use a spoon to wrap the eggs, as seen in Martha’s video. After poaching for 3 minutes, remove the eggs with a slotted spoon, and pat dry on a clean towel. 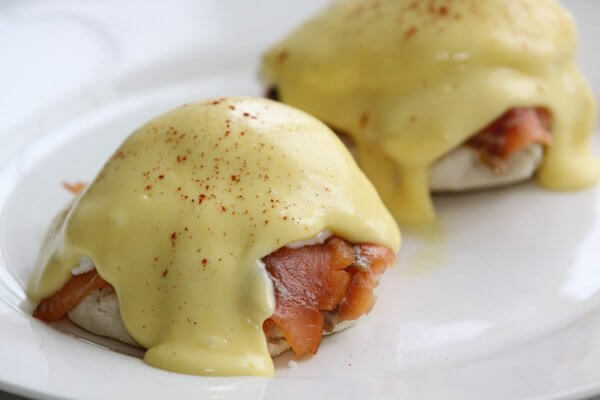 Assemble the eggs Hemingway by placing 2 toasted English muffin halves on a plate (optionally add a bit of butter or drizzle with olive oil), then top with the smoked salmon, a poached egg, and Hollandaise sauce to taste.